Today marked the end of my two week rest period. I woke up and scrutinised my transplant schedule which read "Triple Lumen PICC". 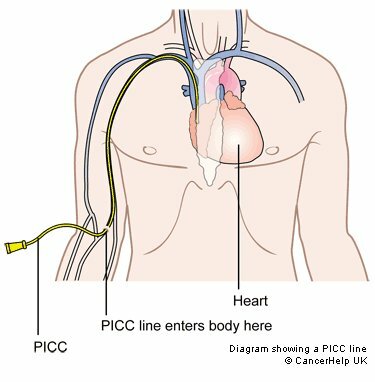 PICC stands for Peripherally Inserted Central Catheter. 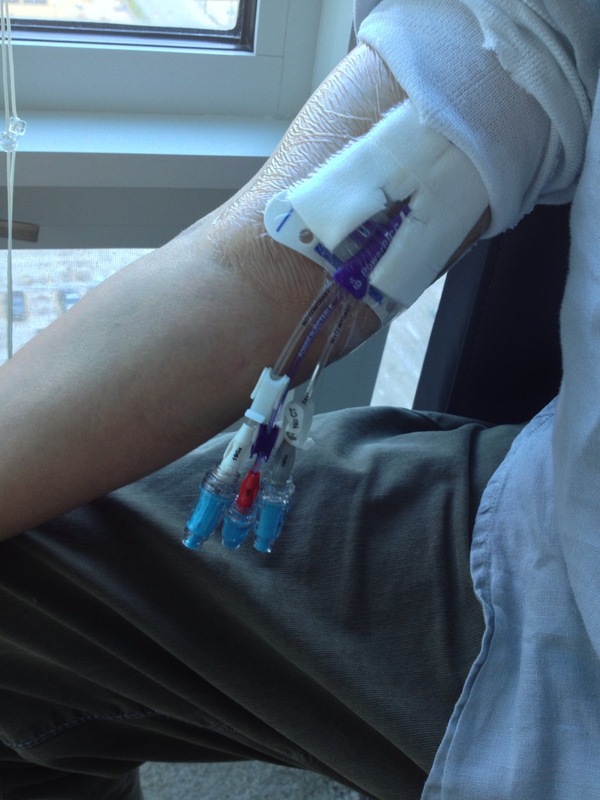 It is a long, slender, small flexible tube inserted into a vein in the upper arm and threaded through until the catheter tip terminates in a large vein above the heart to obtain intravenous access. Being a bit 'needlephobic', I really wasn't looking forward to this and my two week rest period had lulled me into a false sense of security. Anyhow, I hadn't come this far to turn back now. So we made our way to Interventional Radiology, and after completing all the paperwork I was wheeled off into theatre. My procedure was carried out by Dr Jung Lee, who reassured me that it was a straightforward procedure, and would be completed in 20 minutes. My arm was sterilised as the nurse painted me with a blue coloured solution. I looked like a character from Avatar (or a Smurf). Now bacteria-free, the anaesthetic was administered before the vein was pierced with a needle and the long slender tube fed into it. Other than the sting of the anaesthetic, it was a surprisingly comfortable procedure. In order to check that the catheter tip was correctly positioned, a portable x-ray machine was used to take a picture of my chest, but unfortunately the catheter tip had kinked. Dr Lee tried to straighten this with a thin wire, but he was unsuccessful. So it was off to meet 'portable x-ray's' big brother, which could take real time images to simplify the procedure of unkinking the catheter. Another 45 minutes and we were done, and headed back to the apartment hoping not to meet any vampires wanting blood on tap! Tomorrow it's 'showtime' as I will be admitted for the final phase which starts with six days of chemotherapy. PN All this is done as an out patient? RV wow Ben. So this is the day you have been waiting for. All my prayers are with you my friend. By the way, I strongly recommend you write a book at the end of it. You can call it 'SCT made simple'. your posts are so detailed. Looks like when I reach there, you will be neutropenic. JPH Ben our prayers are with you. I have been thinking of all of you all day. PN With Vineeta and the little beauties there the next six days will go quickly. Thoughts and prayers with you. DC We're all thinking of you over here. Good luck and while it will be crap the other side of it will be so much better.